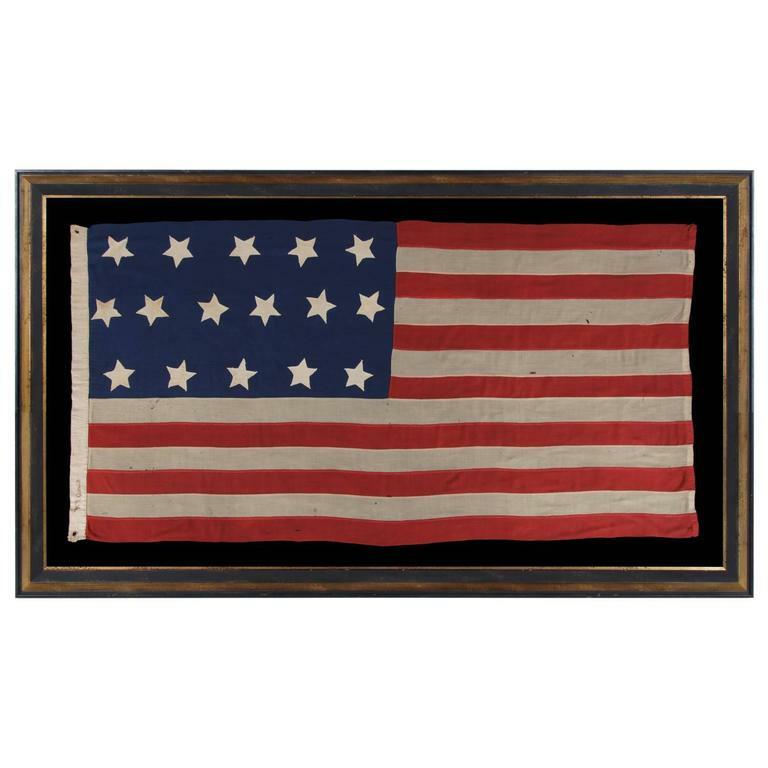 ENTIRELY HAND-SEWN ANTIQUE AMERICAN FLAG WITH 16 STARS, MADE DURING THE MID-19TH CENTURY, PERHAPS DURING THE CIVIL WAR PERIOD (1861-65) TO GLORIFY TENNESSEE AS THE 16TH STATE: American national flag with 16 stars and 13 stripes, made sometime during the mid-19th century. Beautifully hand-sewn throughout, the canton and stripes of the flag are made of Fine merino wool with a lustrous sheen and striking colors, in shades of bright royal blue and scarlet. The stars are made of plain weave cotton and are single-appliquéd. 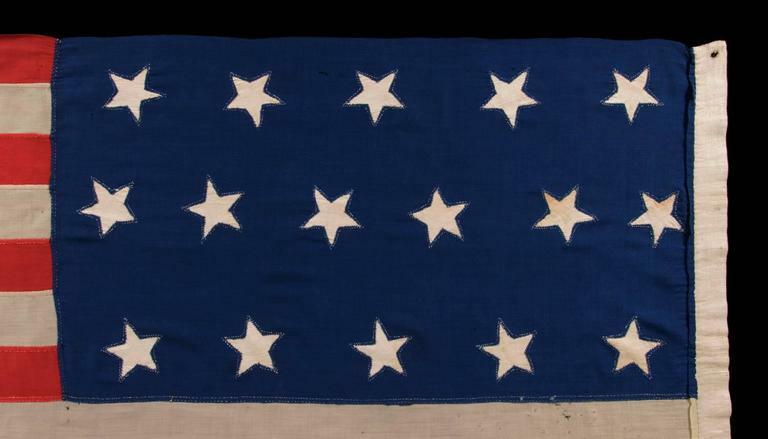 This means that they were applied to one side of the canton, then the blue fabric was cut from behind each star, folded over, and under-hemmed, so that one star could be viewed on both sides of the flag. I always find single-appliquéd stars more interesting, not only because they are evidence of a more difficult level of seam-work and stitching, but also because they are more visually intriguing. Both the sewing itself and stretching of the fabrics over time has results in stars that have irregular shapes and interesting presentation, which is certainly the case here. 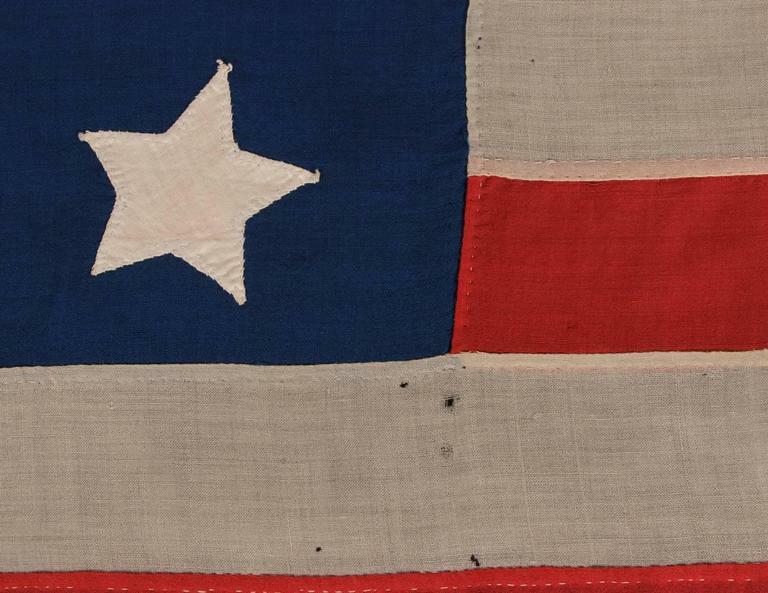 This is why flags with single-appliquéd stars often appeal to connoisseurs of early American textiles. The two visible rows of hand-stitching emphasize their hand-sewn construction and their narrow, starfish-like profiles have substantial folk qualities. 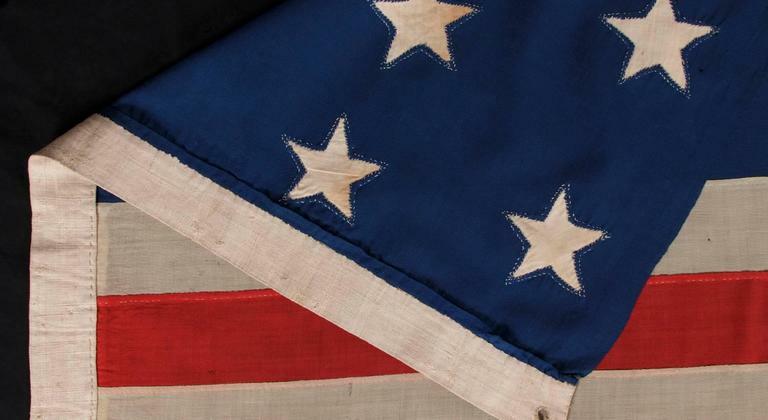 While some flag enthusiasts have pointed to this as a means of conserving fabric, (not having to cut and sew another star to the other side), others suggest that the real purpose was to make the flag lighter in weight. I believe it to have been a byproduct of both objectives. There is a Fine linen binding along the hoist, with 2 hand-sewn, whip-stitched grommets. Along this, near the bottom, on the obverse, the name "R.P. Gould" was inscribed with a dip pen. This would be the name of a former owner. It was common to mark flags in this fashion during the 19th century to indicate ownership. So far research of this name in the relative period around which this flag was made has produced no likely hits, though this is not unusual and the surname is common. There were no Civil War soldiers on either side of the Mason-Dixon that shared the name Gould and these particular initials. Tennessee became the 16th state in 1796. It is interesting to note that while there were 16 states for a period of roughly 8 years, the 16-star count was never official. The star count had been officially increased from 13 to 15 in 1795, by way of the Second Flag Act, which added stars for Vermont and Kentucky. These two states had entered in 1791 and 1792, respectively. It would be 13 more years, however, before the flag would receive another official update. In 1818, by way of the Third Flag Act, the star count was increased to 20 to reflect the 5 additional states that had joined the Union by that time. The act also reduced the stripe count to the original 13, at the suggestion that there soon may be pinstripes with further Westward Expansion. Prior to 1818, however, the logic was to add a stripe with every star. Despite not having been an official star count, 16 star flags were produced in the 1796-1803 era, as evidenced by surviving illustrations and one surviving flag. The only period example presently known to exist has the proper compliment of 16 stripes and is among the holdings of the Stonington Historical Society in Stonington, Connecticut. Other flags with 16 stars, however, were sometimes produced outside the 1796-1803 period. These can be expected to have 13 stripes. 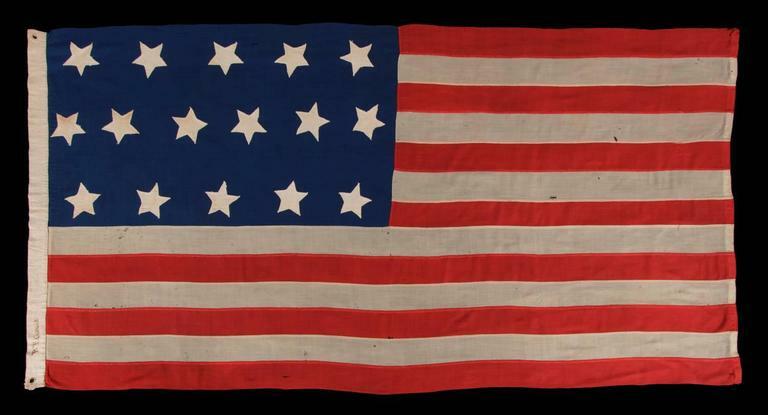 In some cases this was probably intentional, but in others it can logically be assumed that the maker of any given 16 star flag during this era was probably unaware that a period version would have had 16 stripes. One known use of 16-star, 13-stripe flags occurred during the mid-19th century. At this time a number of star counts that were lower than what was official were employed by the Navy for use on small Craft. Those with 13 stars are most common, but other counts were used as well, particularly 16 and 20 stars. The reason for the use of 20 stars is unknown, but it is logical to assume that it may have simply been a matter of convenience, since 20 stars fit nicely into 4 rows or 5 rows. The 16 star flag may have been a product of similar logic. The ability discern individual stars on the American flag at a distance was of concern to ship captains. Keeping the count low on small-scale flags allowed for better visibility. Flag experts disagree about the precisely when the Navy began to revert to 13 stars and other low counts for this practice. Some feel that the use of 13 star flags never stopped, which seems to be supported by depictions of ships in period artwork. It has been theorized by some flag historians that there was a more important reason behind the selection of 16 stars. When the Revolutionary War ended in 1783, the nation’s warships were sold to pay down Federal debt. With the sale of the ships, the Continental Navy and Marines ceased to exist. In 1798, President John Adams signed a bill that officially reestablished the United States Department of the Navy and the United States Marine Corps. Since this took place during the period when we had 16 states (1796-1803), there are some who suggest that the use of the 16-star flag may have paid homage to the founding of these two important cornerstones of the American military. Both 20-star flags and 16-star flags are seen in ship’s paintings, particular during and before the American Civil War (1861-1865). Surviving examples of both are scarce, but those with 16 stars are seen with even less frequency. I have encountered fewer than 10 of the U.S. Navy examples, all of which share the same basic 4 x 4 justified lineal configuration of stars. All are made of wool bunting, as expected for use at sea. The flag in question here, made of expensive, clothing grade wool, would not have been appropriate for extended maritime use. Its stars are arranged in staggered lineal rows of 5-6-5, which is highly unusual. Only one other surviving example that I am aware of shares this design, which is a simple extension of the 4-5-4 pattern, seen on some of the earliest known 13 star flags and which remained popular on that star count through the opening years of the Civil War. The 16 star count would have been appropriate for other reasons. One of these would have been to glorify Tennessee as the 16th state. This might occur on an anniversary of Tennessee Statehood, for example, such as the state's 75th birthday in 1871, or the 1896 Tennessee centennial. With regard to the flag in question here, the latter of these is especially unlikely, given its construction, which is congruent with the 3rd quarter of the 19th century and would be expected in a flag of the Civil War (1861-65). Another possibility is that the flag was made for use at a World's Fair, such as the 1876 Centennial International Exposition, the first event of its kind held in America. Unlike some states, Tennessee did not have its own pavilion at the Expo, but representatives of the state may have displayed exhibits in the huge buildings that bore a multi-geographical focus. Both historic and current flags and banners of all kinds were displayed throughout the fair in great numbers. Yet another reason for the use of 16 stars, though less likely, would have been to demonstrate solidarity within the 16 states that sympathized with the Confederacy. This total would have been accurate in the latter part of the war, following the annexation of West Virginia from Virginia in 1863. It was at this time that 16 represented the 11 official Confederate states plus 5 Border States, now including West Virginia (technically a Free State, but generally sympathized with the South). With confusion and disagreement of all manner of issues, and the loss of homes, livelihoods and loved ones at stake, state-associated patriotism was severely heightened. 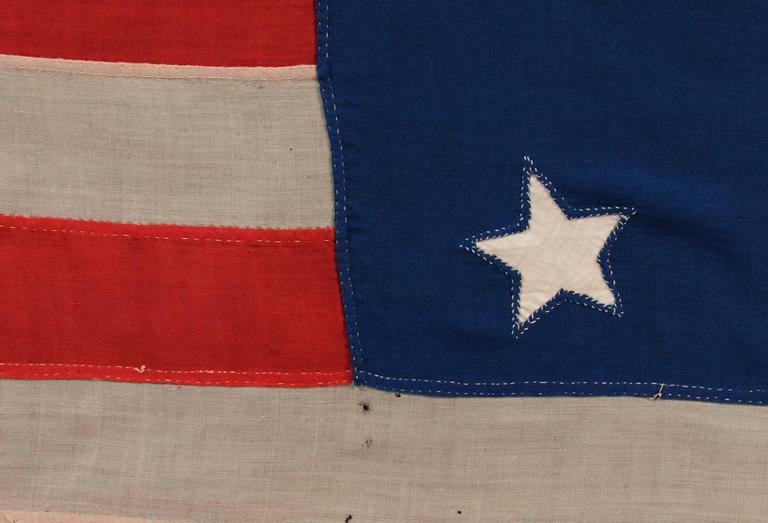 In the North, versions of the Stars & Stripes were made that removed the Southern States. In the South, the opposite was sometimes true and Northern States were removed. In both cases, the counts chosen would depend on the loyalties of the flag-maker, geographic location, and date of manufacture. The various additions and subtractions of states, along with perceptions and opinions, resulted in a wide spectrum of star counts. During this tumultuous period, all sorts of messages were conveyed through the sewing of flags. While some portrayed state loyalties through the number of stars representing the states on each side, others singled out specific states through by displaying their order of admission or dissolution. A count of 16 stars, for example, may emphasize the loyalty of a Tennessee resident to the Union, in the same way that a 10 star flag might demonstrate his/her loyalty to the Confederacy. Tennessee joined as the 16th state, then became the 10th state to officially secede (by way of popular vote on May 6th, 1861, followed by ratification of the state legislature on June 8th). A flag with a state-associated star count would perhaps be less expected in a state with well-defined loyalties, than in one where loyalties were mixed and there was greater need for communication through subtle symbolism. It has been suggested, for example, that flags of this nature sometimes marked places where secret meetings were held, or some sort of aid was available to supporters of whatever cause was being conveyed. Whatever the case may be regarding the reason for its origin, surviving 16 star flags that date to the 19th century are rare. The fact that so few exist raises their interest among collectors, especially those who desire to own a flag in this particular star count, irrespective of the precise period of its manufacture. The speculation of the potential reasons behind the use of this count is certainly compelling, and because this entirely hand-sewn example is so beautiful, it would be a particularly nice addition to any advanced collection. Mounting: The flag was mounted and framed within our own conservation department, which is led by masters degree trained staff. We take great care in the mounting and preservation of flags and have framed thousands of examples; more than anyone worldwide. The background is 100% cotton twill, black in color. The mount was placed in a black-painted, hand-gilded and distressed Italian molding. The glazing is U.V. protective plexiglass. Feel free to contact us for more details. Condition: The flag is extremely well-preserved. There is very minor soiling in the stars. There are very minor losses, in the form of various tiny holes and minor breakdown from obvious minor use in the top corner at the fly end, between the stripe and the roll of its binding. Many of my clients prefer early flags to show their age and history of use. * Additional Notes on the Use of 16 Star Flags on Small Navy Craft: Late flag expert Howard Madaus, one of the most notable experts in the field of antique flags, made the following statement: "The U.S. Navy distinctive "boat flags", wherein the number of stars in the canton was reduced to make them more visible (i.e., larger) seems to have been adopted in the middle of the 1850's. 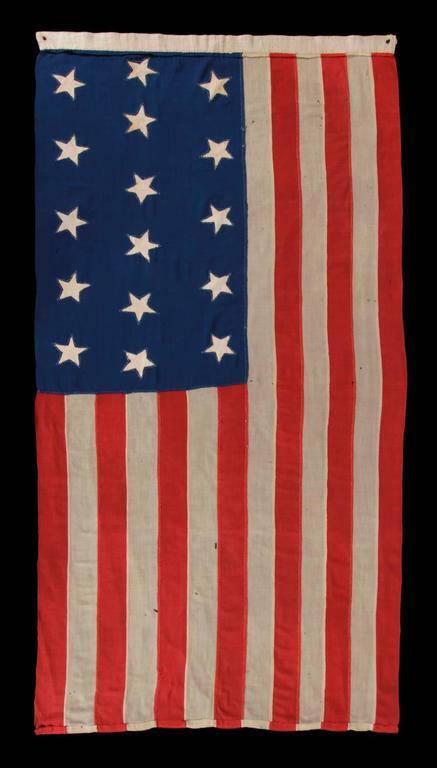 (One of the "boat flag" size flags that [Admiral] Perry carried into Japan in 1853 bears the full complement of 31 stars, while the earliest marked boat flag I have seen from the Boston Navy Yard--and so marked--is dated 1857.) 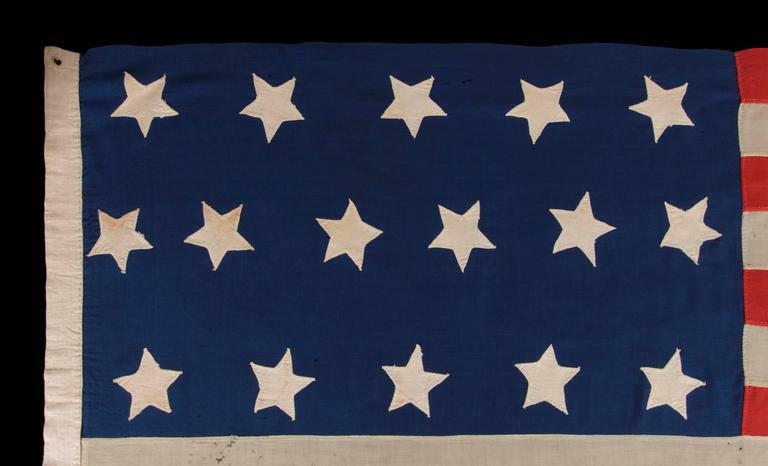 From at least 1857 through 1861, U.S. Navy "boat flags" bore 16 stars, set in 4 rows of 4 stars each. Although some have speculated that the number of stars was chosen to reflect the rebirth of the U.S. Navy in 1798 (when 16 states formed the Union), I suspect that the reason for the 16 stars was merely a matter of practicality." Frame size (H x L): Approximately 49" x 87" Flag size (H x L): 36.75" x 74.5".